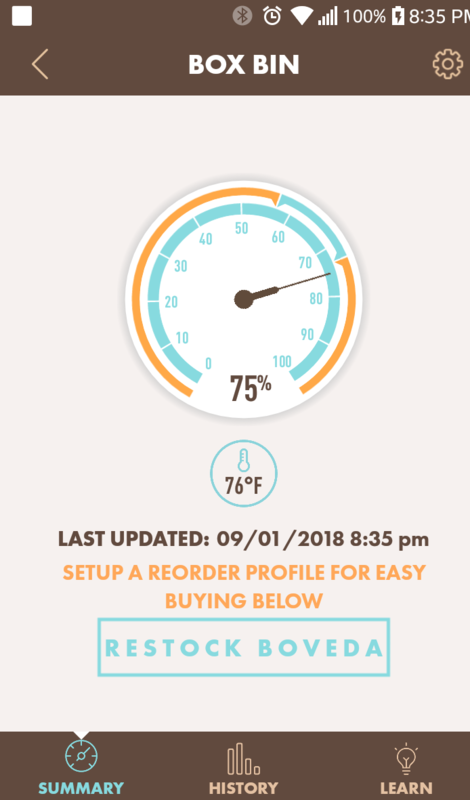 I saw a review of the new Boveda Smart Sensor Bluetooth Hygrometer on Halfwheel and for $20 each including a 75% calibration kit I decided to try two out to see how they work. The herf dog was also interested. I downloaded the app from the Google Play Store while I was waiting to receive the units and I could see that these are Bluestream Sensors that go for $50 on Amazon, but the Boveda app has been customized so that you log into a Boveda account and you can easily set it up to purchase more Boveda humidification packets when needed. It appears to be a good sales tool, probably explaining the low price. You have the choice of a 1 point calibration with the included 75% kit or you can do a more accurate 2 point calibration with a 32% and a 75% packet. I chose to do the 1 point calibration with the included kit. You get to play with the app and exit the app during calibration and one of my sensors appeared to be running high (about 78%) during calibration but once it's complete both sensors were reading 75%, automatically calibrated with no need to remember an offset. The sensors measure temperature and humidity and you can enable a shock sensor which is said to run down the battery faster. The battery is said to last about a year and a spare is included with the sensor along with some velcro if you chose to mount it instead of tossing it on top of your cigars like I did. 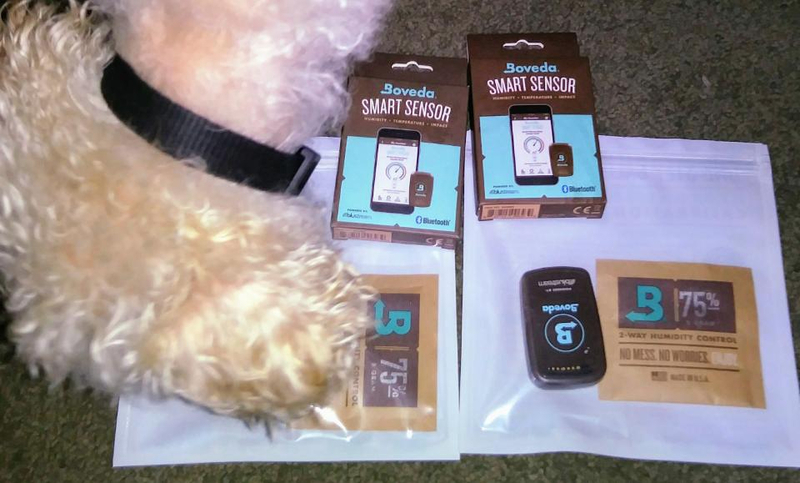 The sensors store 10 days of data which is downloaded to your phone when you connect and also to Boveda. They use Bluetooth so you can't remotely access them unless you have a second phone that you leave at home connected to the sensors, then you can log in with another phone remotely and check on your sensors, if desired. I have a couple of spare phones around so I may try this later. The Bluetooth appears to be Low Energy, but the range on these seems to be pretty good. 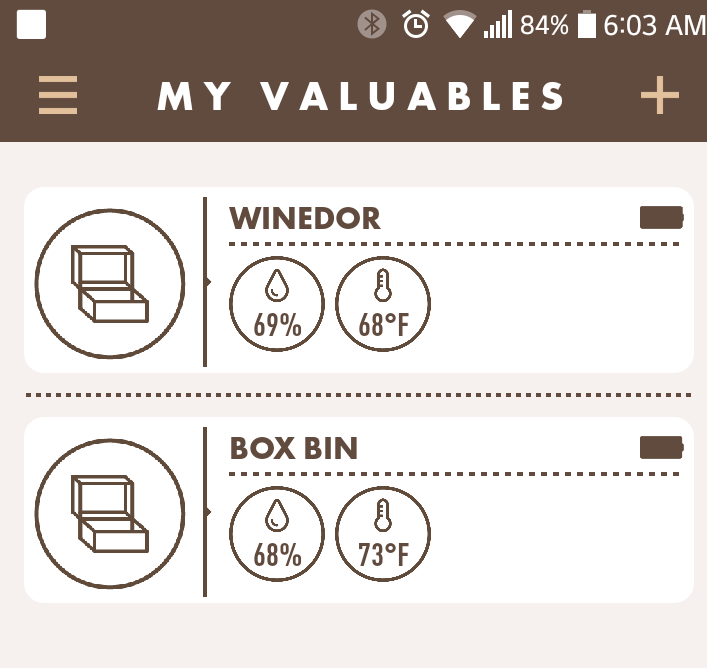 I'm not sure if I can reliably connect to both at the same time since my Winedor is in a separate room than my box bin, but I might be able to put the phone somewhere where they connect to both. I finished calibration and deployed the sensors, so far I'm impressed, this seems to be an easy way to keep an eye on things. I have several digital hygrometers that I never look at, I'll be much more likely to check on things with these and I can look at the history to monitor the temperature swings in my wine cooler and in my box bin. No way to export your data, I've already requested this feature from Boveda but I'm not holding my breath. How can you track and trend something without this capability? My experience with these had been mostly positive, but I wanted to balance this with some things I've noticed. Sometimes it takes quite a while to pull the history from my sensor in the winedor, even when the phone is close to the sensor. Not sure why. 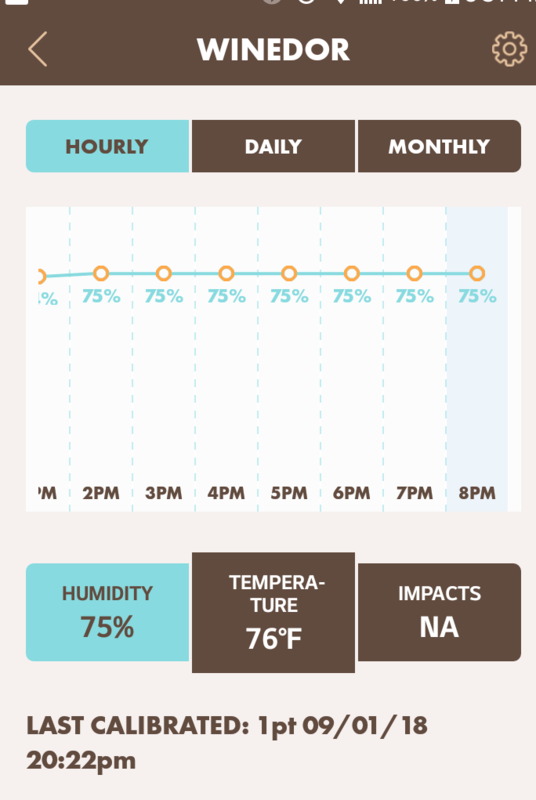 The hourly data is interesting, but if you scroll back through the data, you can lose track of what day the data is representing since they only display the hour in hourly mode. Finally, I sent an email to Boveda requestig export functionality, they referred me to Bluestream, the manufacturer of the device and creator of the app. Since I bought a Boveda, I think they should keep track of their customers feature requests and contact Bluestream. Despite this, I like the sensors and app and feel that I am getting a high value for the price paid and recommend that product if you want to tack humidity and temperature on your phone. Boveda has renamed the product "Boveda Butler" now that this product is available from retailers instead of solely being available from Boveda. The packaging looks like it's changed but I don't believe that anything else has changed. The one retailer that I found selling this is charging the same $20 for the sensor and calibration kit. I notice that this happens with both "butlers" not just the one in my winedor. @Hawkenz, it comes with a calibration pack and is very easy to calibrate. It's Bluetooth only so you need to be in range with your phone to connect, and I've had some challenges pulling history but for the money it's worth it, I think. You can leave an old phone or device in range and logged into the app and WiFi and check with your other phone remotely, I hear. Let me know if you have any questions. Thanks for the information and review. I am in the market for a few more hygrometers so I will just grab a few of these as they seem hard to beat for the price!